Tom Enders’s educational background may not be what you’d expect from the CEO of multinational aerospace company EADS. He studied economics, politics and history at the University of Bonn and the University of California in Los Angeles, completing his doctorate in political science by the age of 28. When combined with his early work experience – jobs as an assistant at the German Federal Parliament, and at a series of German and British think tanks – all signs seemed to point towards a future in politics or academia. A closer look, however, reveals that Enders history may be just what the doctor ordered when it comes to running a company such as EADS. Being part-owned by the German, French and Spanish governments, the aerospace giant has been subject to much political meddling, making knowledge of politics an asset for managers. Throw in Enders’s role as a reserve major in the German army, a two-year stint in the planning department of the German Defence Ministry, a helicopter pilot’s license and a passion for skydiving, and what do you get? A man who, despite no obvious educational background in business or aerospace, fits the EADS profile almost perfectly, and more vitally has the potential to lead the company forward . Enders’s foray into the business world began in 1991 when he joined the marketing department of DaimlerChrysler Aerospace (DASA). He was soon promoted, becoming head of defence and security systems when DASA merged with Aérospatiale-Matra and Construcciones Aeronáuticas SA to form EADS. In 2005, he became co-chief executive with Noël Forgeard under a company structure which saw the top job split between a German and a Frenchman. After a successful start to his new role in 2005, the company suffered the following year when delays to the launch of its Airbus A380 super jumbo and a lacklustre bottom line led to a 30 percent drop in its share price. Problems were further compounded by Forgeard’s implication in an insider-trading scandal. Forgeard denied any wrongdoing but the scandal forced him to resign, with Louis Gallois replacing him as co-CEO. In mid-2007, it was decided that the co-CEO system would be scrapped. EADS’s new CEO would be Gallois, with Enders becoming chief executive of Airbus, its main subsidiary. Airbus was undergoing significant restructuring at the time under a plan entitled Power8 which saw 10,000 jobs cut and the sale of manufacturing plants. The first A380 – the company’s marquee plane – was finally delivered to Singapore Airlines in October 2007, a year behind schedule. Things would pick up, though, as Airbus negotiated a $17bn contract to deliver aircraft to Chinese operators following a good showing at the 2007 Dubai air show. In 2008, it delivered an impressive 483 aircraft and took on almost twice as many orders. 2011’s Paris air show would be the crowning moment, however, as the company took orders for 730 aircraft totalling $72.2bn: a record in the civil aviation industry. The year would end with a record total of 1,419 commercial orders and 534 deliveries, representing the most successful year in company history. Under Enders’s stewardship, Airbus also embarked on a programme of international expansion into emerging markets, opening an assembly line in China (the company’s first outside of Europe). 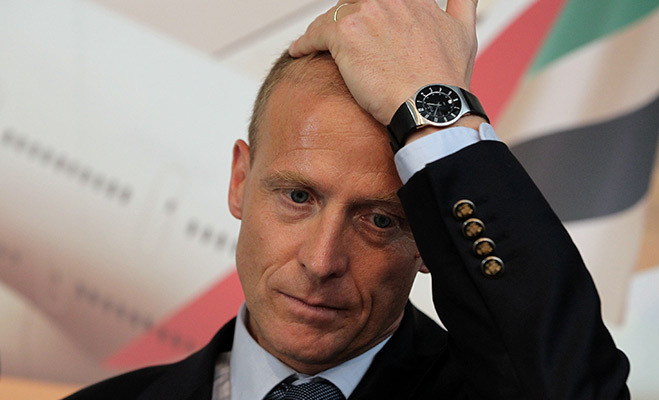 In 2012, Enders left the Airbus job to become Chief Executive at EADS, where he set out a bold plan for the future of the company. The plan, entitled Vision 2020, was intended to help EADS diversify its business away from overreliance on Airbus by merging with Britain’s BAE Systems in a deal worth €36bn. Enders hoped the merger would make EADS more competitive with its main rival Boeing, as well as providing the company with access to the US defence market. The tie-up would also help limit political interference in EADS because France and Germany would see their stakes in the company reduced. Unfortunately for Enders, the deal would never come to be. It required the consent of the UK, France and Germany, and while the first two agreed, the Germans were unmoved. Enders was surprised at the opposition to the deal, writing in a letter to employees after the fact: “I’m ready to admit that we never expected to face such opposition against the deal, in particular not in Berlin.” He had also blown his chance to convince Angela Merkel, the German Chancellor in person. An ill-advised first attempt at hang-gliding saw him tear the ligaments in his arms, making him unable to accompany her on an official trip to China. Nor has Enders given up his goal of reducing political interference in EADS’s affairs. Spurred by the intention of German carmaker Daimler and French media group Lagardere to sell their stakes in the company, EADS recently outlined a major shakeup to the company’s governance. The plan, endorsed by Paris and Berlin, lowers effective state influence over EADS’s operations from 50.5 to 28 percent. A more limited shareholder pact was also introduced to further curtail government interference. But even though the deal will lessen state interference in the company, it will not eliminate it. Michiel Wurfbain, a lawyer at Simmons & Simmons, said: “A combined government shareholding of 28 percent… could constitute a blocking minority on key votes at shareholder meetings, depending on the level of attendance.” For Enders, however, the planned shakeup may be counted as a success and help make his job more like running a normal company.